Important Notice: This page contains tutorials for HYDRUS 1.x. Tutorials for new version of HYDRUS (version 2.x) can be found here. We will update this page soon. We would like to welcome you to a quick tour of the HYDRUS software. Videos QuickTour1 (Level 2D-Standard) and QuickTour2 (Level 3D-Standard) will show you the most important parts of the HYDRUS graphical user interface in just a few minutes. You can find more detailed information and suggestions on using HYDRUS in the following "HYDRUS Tutorials" section. The purpose of tutorials is to give HYDRUS users hands-on experience with the software package. Several examples are provided to familiarize users with the major parts of HYDRUS (e.g., the Graphical User Interface, the Project Manager, FE-Mesh generation, specification of Domain properties, Initial and Boundary conditions, and Graphical Output), and with the main concepts and procedures of pre- and post-processing (e.g., domain design, boundary and domain discretization, initial and boundary conditions specification, and graphical display of results). Tutorials are divided into four main groups dealing with various features of a) the Graphical User Interface, b) Three-Dimensional Domain Design and FE-Mesh Generation, and c) Two- and d) Three-Dimensional Examples. We will be continuously adding new examples as we see the need to explain various features of HYDRUS. We encourage HYDRUS users to provide us with additional examples (e.g., helpful classroom exercises) that they believe should be included on this web page, or discussed in more detail in one of our short courses. This demo shows the main Tabs of the Navigator Bar and the View Window, and demonstrates the definitions and numbering of the main geometry objects. This demo shows how to use Working Planes when designing complex transport geometries. This demo shows how Hydrus-2D projects (a previous version of HYDRUS) can be converted into the HYDRUS (2D/3D) GUI environment. This demo demonstrates how the display of different objects in the View Window can be modified using the Display Options command. This demo demonstrates how to use multiple surfaces to define a single transport domain, and how these multiple surfaces can be used to assign various domain properties (e.g., materials). This demo demonstrates how to design a complex two-dimensional transport domain that includes two holes and an internal surface. The transport domain is then discretized using a refined FE-Mesh inside of the internal surface. This series of three demos shows how users can create a transport domain shown on the picture. The demonstration is divided into three parts. First, the main transport domain is defined, then a vertical hole is created in the domain, after which the heights are adjusted. This series of three demos shows users how to create a transport domain shown on the picture and to discretize it into finite elements. We first create the transport domain, then add lines at the surface that will help us to discretize the transport domain into finite elements in the next step, after which we implement the finite element discretization. This series of three demos shows users how to create a transport domain in the picture, to discretize the domain into finite elements, to create sections, and to specify initial and boundary conditions. This demo shows how to design a complex three-dimensional transport domain (which includes horizontal pipes). The transport domain is divided into four sub-layers (one with variable thickness). Additional FE-Mesh sections are generated as intersections of sub-layers and vertical columns. The use of FE-Mesh sections to assign domain properties is demonstrated. This demo shows how a complex three-dimensional domain can be defined using boundary points imported from an external ASCII file. This demo shows how to design a complex three-dimensional transport domain and how this domain can be modified by removing selected Finite Elements. 2.09 - 3D Domain, Solid 8 - How to split a Solid into angled Sub-Layers. This demo shows how to split transport domain to geometrical Sub-Layers with non-constant thickness. This demo demonstrates how to import a bitmap (*.bmp) and use it as a backgroung image for definition of domain shape, distribution of materials, etc. This demo demonstrates how to create cylindrical openings in a 3-D geometry that don't reach down to the base surface. Note the use of Sub-layers when defining the transport domain (i.e., a Solid). This leads to an automatic generation of FE-Mesh Sections representing Intersections of these Sublayers and basic Solids that can be then individually manipulated (e.g., removed from the system). This demo shows how to import FE-Mesh sections from a text file. Sections are given by indexes at scattered 3D points and, as soil layers of complex shape, can be used for definition of material distribution, etc. The file Test3_Sections.txt (754 kB), used in the tutorial, can serve as a description of the file format. This function is available in version 1.09 and later. This demo demonstrates how to create approximate spherical shapes. The sphere is created from a cylinder by removing elements from the FE-mesh. This tutorial demonstrates how to define properties on internal curves using Geo-sections and Mesh-sections. Note that boundary lines and internal curves can be declared as "Geo-Sections", which can then be used to assign various properties, such as materials. This feature is available in version 1.11 and later. This demo shows how to create FE-mesh sections of arbitrary shapes and directions. The mesh sections allow the user to see the interior of the computational domain. This demo shows how to create FE-mesh sections with precisely defined shapes. The required shape is defined by additional curves inserted into the base surface. Other recommended video tutorials regarding FE-mesh sections: 2.11 and 2.01. 3.01 - Infiltration into a one-dimensional soil profile. The internal structural mesh generator is used to construct a one-dimensional soil profile using two vertical columns. Ponded infiltration of water and solute is initiated with a zero pressure head at the soil surface, while free drainage is used at the bottom of the soil profile. Users will become familiar with most dialog windows of the main module, and with the use of the internal structural mesh generator. 3.02 - Subsurface Line Source. A subsurface line source (e.g. drip irrigation) of water and solute is simulated in a vertical cross-section. A variable flux boundary condition is used to simulate irrigation and fertigation pulses. An unstructured finite element mesh is generated using the Meshgen program. This example familiarizes users with the basic concepts of transport domain design in the graphical environment of HYDRUS, with boundaries and domain discretization, as well as with the graphical display of results using contour and spectral maps. 3.03 - Furrow infiltration with a solute pulse. Alternate furrow irrigation with a solute pulse into a soil profile with a subsurface drain is considered. Users will become more familiar with the basic concepts of transport domain design in the graphical environment of HYDRUS, including how to numerically define boundary objects, as well as allowing them to gain a better understanding of boundaries and domain discretization. 3.04 - Flow and transport in a transect to a stream. Water flow and solute transport in a vertical transect with a stream is considered. The transport domain is relatively complex and consists of objects formed by polylines and splines. The problem, divided into three parts, also demonstrates how the results of a previous simulation can be used in follow-up calculations with different boundary conditions or having additional features. The example in this tutorial represents a modified Subsurface Line Source example (tutorial 2 of HYDRUS (2D/3D)). It also takes into consideration a subsurface line source (e.g., similar as for drip irrigation) in a vertical cross-section. The example considers a short pulse of fumigant instead of a water and nutrient pulse. The (x, z) transport domain is again 75 x 100 cm2, with the source located 20 cm below the soil surface on the left boundary of the transport domain. A short duration (0.01d) pulse of fumigant is applied with infiltrating water (a radius of the dripper, r=1 cm; a circumference of the dripper; O=2?r=2*3.1415*0.01 m=0.06283 m; infiltration flux, Q=Oq= 0.06283 m*0.60 m/d= 0.0377 m2/d). Unit (dimensionless) concentration is applied at the dripper. 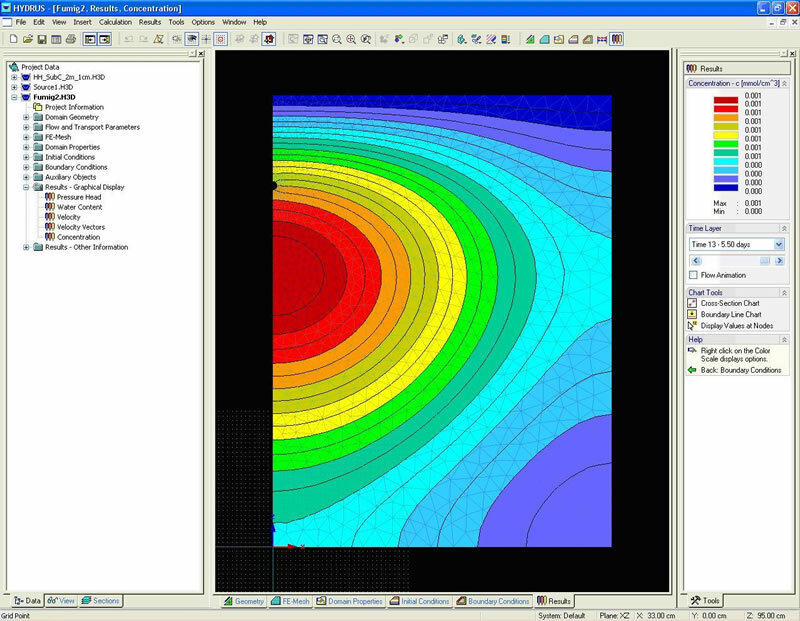 An unstructured finite element mesh is generated using the Meshgen program. The example is divided into four parts, evaluating effects of various surface boundary conditions (resistances). This example will familiarize users with the basic concepts of transport domain design in the graphical environment of HYDRUS, with boundaries and domain discretization, and with the graphical display of results using contour and spectral maps. Instructions are similar to those for Tutorial 2. Different parts are emphasized in bold (and highlighted). This example can be carried out independently of Tutorial 2, or the Tutorial 2 project can be modified as needed. 4.01 - Three-Dimensional Water Flow and Solute Transport. This tutorial considers water flow and solute transport in a simple three-dimensional transport domain. The transport domain is a relatively simple hexahedral domain with a slope in the X-direction. Dimensions of the transport domain are 1000 * 250 * 200 cm and there is groundwater 100 cm below the soil surface. There is a source of water and contaminant at the soil surface. The example is divided into two parts. In the first part, the geometry of the transport domain and its discretization are defined, and initial and boundary conditions are specified. In the second part, the final pressure head profile from the first run is imported as an initial condition, and a pulse of solute is added to the surface source. The example thus again demonstrates how results of a previous simulation can be used in follow-up calculations with different boundary conditions or additional features. Users will learn how to define a simple three-dimensional transport domain and how to use Sections when defining initial and boundary conditions. Users will also learn various ways of viewing the transport domain and simulation results. Please note that some tutorials have been created at a PC with the Windows operating system in the Czech Language. Consequently, button commands for which the text is supplied directly by an operating system may have a Czech text. Here is a brief list of translations: Ano = Yes, Ne = No, Storno = Cancel, Použít = Use, Nápověda = Help.